This page displays *all* news items from Communications and Computer Workers Industrial Union 560. For an overview of the IU 560's history and contact information, please visit our homepage. If you are reading this then over 40,000 CWA union members have walked off their jobs as part of a three day strike against AT&T. 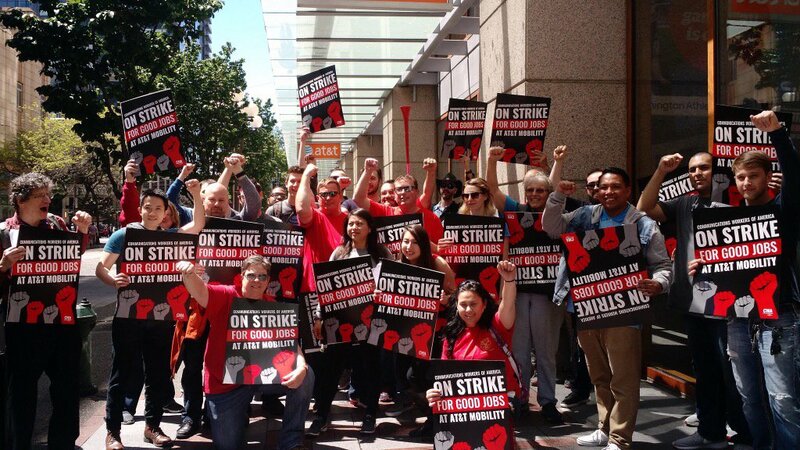 The strike at the telecommunications giant is just one of the latest in a string of strikes by workers in the industry that have all pushed back against attacks on wages, health care, job outsourcing, and corporate globalization. Despite tough talk from both major capitalist parties and Trump in particular, since the economic meltdown of 2008, the only thing that has changed is that billions of dollars have moved out of the hands of poor and working-class people and into the hands of the billionaires – who are now running the government. IWW.ORG Wins Shmoop "Best of the Web" Award! On April 5, 2010, iww.org won Shmoop's Best of the Web History of Labor Unions! "Shmoop is an education website for students and teachers (middle school through college ages). [Their] mission is to make learning fun and relevant for today's students. Each of [their] learing guides includes a "Best of the Web" section, where [they] point teachers and students to quality, reliable websites for further exploration, and [they] picked [our] site! "[Their] writers (who are mostly Ph.D. students at Stanford, Harvard, Berkeley, etc.) pick the sites that go into their Best of the Web section. Teachers and students rely on [their] expert writers to point out only the highest quality websites. . ."
At midnight April 5, 2009 contracts for most of the component groups represented by the Communications Workers of America (CWA) at the telecom giant AT&T have expired. After weeks of mobilizing, around 90,000 workers are poised to strike one of the largest and most profitable multinational corporations. A job action by CWA would be the largest and among the most significant labor action in the United States since the UPS strike in 1997. It would also be the first major strike under the Obama regime. The brewing confrontation could set the tone for class struggle in the U.S. for the near future. AT&T has been pressing hard for major concessions from its call center, billing & ordering, and technical workers, especially in the area of health care. The company is demanding harsh cost shifting in the form of premiums and huge deductables for current employees and even steeper cuts for “second tier” workers hired going forward. AT&T is also demanding concessions in areas of seniority, over-time, and discipline. Raises would be replaced for the first two years by one-time lump payments. AT&T corporate PR hacks have been spinning that healthcare must be reduced to avoid a repeat of what has happened to the U.S. auto industry. But AT&T is not General Motors. It is in a growing, innovative industry - one where AT&T bosses made $12.9 Billion in profits in 2008 alone. Besides, the U.S. healthcare crisis and its skyrocketing costs are not the fault of workers and their families and we should not be made to shoulder its burden. Workers at AT&T are furious that such a rich company would attack their families’ access to healthcare.